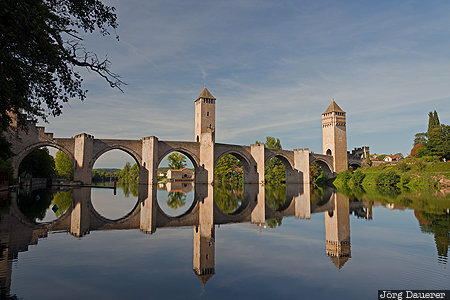 The medieval bridge Pont Valentré and its perfect reflexion in the calm Lot river in Cahors illuminated by warm evening light. Cahors is in the region Midi-Pyrénées in central France. This photo was taken in the evening of a sunny day in September of 2015. This photo is part of the exhibition Bridges (February 2019). This photo was taken with a digital camera.